In this buying guide, we delve deep and look at the Best Husqvarna Chainsaw for Homeowners & Landscapers. When we selected the best Husqvarna chainsaw for homeowners and landscapers, it’s not because Husqvarna only caters to those needs. Husqvarna is a well-known and trusted brand. Their largest chainsaw is one of the most powerful in the world. It’s used by loggers to fell big trees at a rapid rate on the steep slopes high up in the mountains. It’s a tough environment that makes great demands on both the loggers and their machines. To my mind, those tough chainsaws are proof of Husqvarna’s commitment to excellence. While the user requirements of homeowners and landscapers differ, it’s comforting to know that you’re buying a quality brand when choosing a Husqvarna Chainsaw. For light work like pruning, a battery-powered, lightweight but powerful Husqvarna 120i chainsaw with 14” bar. A well-rounded chainsaw for all of your yard cutting tasks. It has a powerful engine with reduced-emissions. The Husqvarna 440E chainsaw, it’s supplied with a 16” bar, but the maximum bar length is 18 inches. For working on a platform above the ground as used by arborists and landscapers. The superbly balanced Husqvarna T435 chainsaw, its standard bar length being 13 inches. Husqvarna North America is part of the Husqvarna Group manufacturing and distributing in the Americas. The Husqvarna Group is a Swedish manufacturer of outdoor power products including chainsaws, trimmers, brush cutters, cultivators, garden tractors, and mowers. Headquartered in Stockholm, Sweden, the group also produces consumer watering products, cutting equipment and diamond tools for the construction and stone industries. Chainsaws are used for varying tasks like sculpting ice and many other forms of sculpting, maintaining parks, landscaping and foresting. Husqvarna outdoor power products are now used in a rhino-dehorning campaign in South Africa in a bid to save these unique animals from poachers. Because it’s only the horns that are brutally taken by the poachers, removing the horns without harming the animal, saves them. The Husqvarna Group provided a battery chainsaw and a gas unit. The gasoline saw for the initial cutting, and the battery saw for finer trimming. Husqvarna has been in existence since 1689 when it started as a rifle musket factory. The state-owned rifle factory had some 1,000 employees in the beginning, and in 2017 they employed 13,252. Their Subsidiaries include Gardena AG, McCulloch Motors Corporation, KTM, and many more. This company excels in everything they do, and it’s no small wonder that they manufacture such excellent chainsaws. ✓ Fun Fact : If you’re ever in Sweden, consider visiting the Husqvarna museum. The perfect battery-powered chainsaw for homeowners who need a chainsaw for light-duty pruning around the yard. When thinking about the best Husqvarna chainsaws, we sometimes overlook the fact that they have a great range of cordless power tools. The Husqvarna 120i 14-inch brushless chainsaw is one such tool. The brushless motor has the advantage that it delivers a high torque to weight ratio for increased efficiency. It increases reliability, runs quieter and lasts longer. The Husqvarna 120i chainsaw can be used to thin trees for fire safety and then to buck it for use as firewood for heating. Maybe less frequently, but equally effectively, it can be used on trees and branches of 6 and 12 inches in diameter. This is a capable chainsaw that will buck for an hour and a half on one charge. 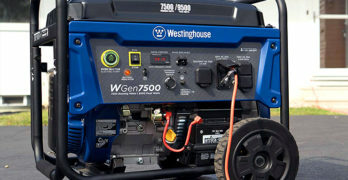 It can be used to do intermittent, light-duty cutting for about three hours on one charge. If you were continuously cutting large diameter logs, the battery probably wouldn’t last as long. Charging a fully depleted battery usually takes 2 to 2-1/2 hours. If this is inadequate, a backup battery to extend the cutting time would be advantageous. The BLi20-battery pack is designed for recurrent demanding use, and it fits all Husqvarna handheld tools. You can quickly switch the same battery between a Husqvarna trimmer, blower, chainsaw and hedge trimmer, and keep working. Though, the cost of an additional battery is about 69% of the 120i chainsaw. Obviously, keeping the chain sharp lowers the load and will also extend your cutting time. This Husqvarna chainsaw is not only lighter and quieter than a gas saw, but vibrations are also reduced. It also starts and stops instantly. It’s convenient and ready for those occasional cutting and bucking tasks. A real jewel. It has low noise levels that allow you to work in residential areas without disturbing the neighbors. It weighs less than 6.5 pounds, so it’s light compared to most gas chainsaws, which can weigh up to 23 pounds. The 120i comes with a Husqvarna 14 inch bar and chain, both designed for a low kickback to enhance safety. The chain has a 3/8 inch pitch, 0.05-inch gauge, and 52 drive links. This is a popular size for homeowner chainsaws. The maximum speed of the chain is 37.73 feet/sec. It’s slower than gas chainsaws, but in line with the chain speed of many electric models. It’s perfectly adequate for light cutting. Some users commented that the automatic chain oiler does not oil the chain nearly as heavily as other chainsaws, making it less messy. It also uses less oil. Should you be concerned about the chain lubrication, the following tip will help. Point the bar to a light colored washable surface and run the saw for a minute. The oil will make a dark line on the surface to confirm that the system is functioning properly. This lightweight Husqvarna chainsaw is ideal for occasional use to carry out all those light cutting duties around the yard. Like all the Husqvarna chainsaws in our selection, it has impressive features like tool-less chain tensioning. The Inertia activated chain brake stops the chain if kickback occurs and the chain brake design allows better visibility of the bar tip. If the 120i is idle for more than 60 seconds the power button needs to be pressed to restart the chainsaw. This extends the battery charge. The chainsaw won’t start when the chain brake is engaged, you have to disengage it first. If you overload the motor by pushing too aggressively into the wood or by tangling the chain in foliage, the chain will stop. Then you simply back off slightly and try again, it will work. Want more information, read our dedicated review on the Husqvarna 120i. A well-rounded chainsaw for all of your yard cutting tasks with reduced-emissions. Best Husqvarna chainsaw if you’re environmentally conscious. Fewer emissions with this model. Lower fuel consumption and emissions. Low Vib (Anti-Vibration System) – System designed to reduce vibration levels to the operator, which lessens fatigue. The Husqvarna 440E can be rated as a semi-professional chainsaw. It’s easy to maneuver and powerful enough to tackle most medium-duty homeowner jobs. The Husqvarna 440e chainsaw is almost identical to the 440, apart from one major difference. The e-series model has tool-free chain tensioning whereas the 440 requires the use of the included T-wrench. I consider this feature as a chain saver. It makes it incredibly easy to quickly adjust chain tension, right where you are. This 440E chainsaw is powered by a 40.9cc two-stroke Husqvarna X-Torq engine. These are impressive engines with a long life, lower fuel consumption and reduced emissions, making them CARB compliant. The 440E can cut through an 18” log in under a minute without getting bogged down, which is pretty impressive. I like the way these high compression engines start. Resistance in the starter cord is low, and the air purge ensures that the fuel is free of air. It results in quick and easy starting. When the engine runs, you will immediately notice that vibrations from the engine are very well dampened by the damping system. The Husqvarna 440E is supplied with a 16” bar. You can, however, fit a 13, 15, 16 or 18-inch bar and chain. The fuel tank provides enough fuel for around 2 hours use. There is a handy little window on this model to see how much fuel is left in the tank. The air injection system removes larger dust/debris particles from the cooling air by centrifugal force. It keeps the engine cleaner and reduces air filter cleaning and greatly extend engine life. This is a lightweight and efficient all-round homeowner chainsaw. It’s ideal for those looking for a chainsaw that is exceptionally easy to start and maneuver. It starts easily, even when not pulling as abruptly as usual. The X-Torq engine gives you lower fuel consumption and emission levels are reduced. For heavy-duty work like felling trees, limbing and cutting firewood. This is one of the best Husqvarna chainsaws if you do a lot of cutting all year round on large trees — fallen or standing. Not for amateurs. Due to it’s long bar and chain, make sure you know how to safely handle a chainsaw before using. King of chainsaws. Great balance between power and price. 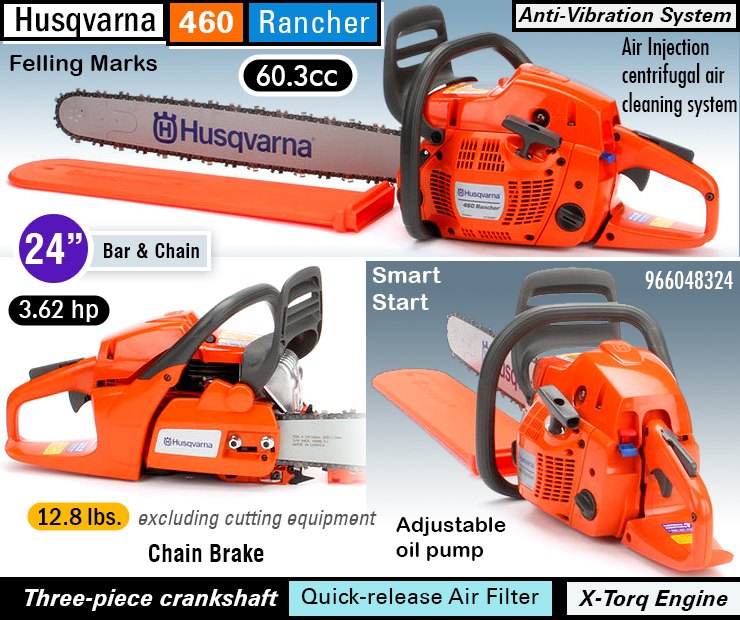 NOTE : The Husqvarna Rancher is also available with a 20″ bar and chain. ✓ View or download the MANUAL of SPEC SHEET for the Husqvarna Rancher. This is a versatile chainsaw that will tackle any job the homeowner or ranger can throw at it. The Husqvarna 460 Rancher is not a commercial-grade chainsaw, it’s built for general use. Quality of materials, quality build, and outstanding performance are its virtues. You end up paying a little more, but you’re getting a lot more. It has all the safety and ease of use features that Husqvarna is renowned for. Although this Husqvarna chainsaw can take a 24” bar, some users feel it is best balanced when used with a 20” bar. I think it’s a wonderful homeowner/ ranger chainsaw. I could not confirm it, but I get the feeling the machine is not fitted with a spiked bumper when delivered. To fit one you’ll have to contact your service agent. Their effective LowVib’ anti-vibration system minimizes vibration transmission at the handles, improving operator comfort and reducing fatigue. Vibration on this chainsaw is really much lower than most others. The Husqvarna 460 chainsaw has an automatic oil pump for chain lubrication. It’s adjustable, to compensate for the bar length. Which means that you can control the rate of oil flow depending on the length of the bar you are using. It’s easily done with a simple click screw setting with three positions. The Husqvarna side-mounted chain tensioning system allows quick, easy on the spot tensioning. There’s no need to rush back to the toolbox to find the right tools. Making it convenient to tension the chain, adds to the safety of the chainsaws by preventing the chain derailing. Keeping the chain tension correct also extends chain life. To reach the air filter, plug and engine cooling fins for maintenance, you have to remove the top cover which is held down by screws. It exposes the engine with the plug easily accessible at the top. The quick release air filter can easily be removed for cleaning or replacement. It’s more proof of how on the spot maintenance, extending engine life, is done as quickly and easily as possible. A centrifugal air cleaning system means that dust and large particles are centrifuged out by the cooling fan before they reach the air filter. This improves engine life and the number of times the filter needs to be cleaned or replaced, extending cutting time and enhancing engine performance. Its X-Torq engine with its forged three-piece crankshaft is able to handle the toughest applications, and it’s superbly balanced to reduce vibrations. This little engine is built to last and can easily run at a maximum power speed of 9,000 rpm. At that speed, the chain speed is a useful 65.62 feet per second. It runs at higher compression ratios to provide better fuel consumption and cleaner emissions. This helps meet strict environmental control standards. The combined choke and stop control, and a convenient air purge ensures that the engine is easy to start, first time, every time. The air-purge is used to remove air from the carburetor and the fuel system and works well. I like the inertia activated chain brake that helps reduce the likelihood of injury resulting from kickback. This safety feature is in addition to the normal chain brake. It acts when the bar is thrown back at the user even when a firm grip is maintained, and the normal handguard is untouched. Like all Husqvarna chainsaws, the body has distinct felling marks that should aid in making tree felling safer. During my research, some owners reported engine failure attributed to the fuel used. You must ensure that you use premium low-ethanol, ethanol-free or pre-mixed fuels. Chainsaws, by any manufacturer, are not compatible with ethanol. Though the ethanol-free fuel is more expensive, it’s still better than replacing the saw. Designed for cutting above ground or on a platform. ✓ View or download the MANUAL for the Husqvarna T435. The T435 is Husqvarna’s mid-sized tree care saw. It´s a lightweight, powerful chainsaw that’s ideal for pruning in parks, vineyards and fruit orchards. The chainsaw body weight, excluding cutting equipment is only 7.5 pounds, both handles are positioned at the top. Its lightweight and the superb balance makes it the perfect saw to use with one hand while working at height. Its X-Torq engine has a cylinder displacement of 35.2 cm³ and delivers 2.01 hp. It’s not a toy, with its recommended bar length of 12” up to a maximum of 14”, it’s a serious chainsaw for all day use. It’s perfectly suitable for arborists, landscapers, and homeowners. All the standard Husqvarna chainsaw features are incorporated. The adjustable oil pump allows you to control oil flow depending on the application and weather conditions. Chain tensioning is done from the side which allows for quick and convenient chain tensioning. Changes to the design of the chain brake handle delivers better visibility of the guide bar tip. The rope attachment is unique to the range. It’s a sturdy point on the handlebar for fastening a rope, making it easy to hoist the saw up a tree. Top-handled chainsaws can be used with one hand when needed. This is a deliberate safety compromise for particular working conditions. The T435is designed for working at height, such as up a tree. In all other cases, whenever possible arrange the cutting task so that it’s carried out with two hands. For the top-handled saw, the rear handle and its operating controls are positioned on the top of the saw body. The front handle remains the same. The inertia activated chain brake which reduces the likelihood of injury due to kickback is also incorporated in this top-handled chainsaw. Operator safety is always a priority for Husqvarna, and with this type of chainsaw, it’s even more important. The owner’s manual is always worth reading at least once. For a chainsaw, this is even more important. You will find all the safety features listed and with lots of warnings that will help make the chainsaw a lot safer to use. Chainsaw carving often makes deliberate use of plunge cuts and cuts on the tip of the bar. The tendency of a chainsaw to kick back is least controllable at the tip. The cutting tips tend to grip the wood and cause the tip to “run-away”. A chain nose with a smaller diameter allows fewer teeth to make contact at a time, making it more controllable. The result is that the force generated during a kickback may be reduced. Specialist carving bars are available with smaller pointed noses. More on that topic will follow later. Kickback can happen very suddenly. Kickback is when the chainsaw, bar, and chain jump back at the user. If this happens with a moving chain, it can cause very serious, even fatal injuries. To limit kickback, you have to understand it and know how to control kickback using the right working technique. The chain brake safety feature locks the cutting chain so it cannot move. When activated, it applies a steel brake band around the driven clutch drum and forces it against the drum with a powerful spring. Even when the chain is running at full speed, it will stop the chain immediately. By pushing the top handguard forward, the chain brake is engaged, pulling it back will release it. The chain brake may be activated deliberately by rotating your left wrist to knock the top handguard forward with the back of your hand. It’s reset by reaching forward with your fingers to pull the top handguard backward. During kickback, your left hand may be violently dislodged from the front handle by the force. The top handguard will be forced onto your hand, activating the chain brake. The chain brake may also be applied for other purposes. To stop the chain when you are moving between cuts or changing the position of the saw. When starting a chainsaw from cold, you apply the chain brake to hold the chain, allowing the engine to run faster. It also prevents uncontrolled chain movement, which can be hazardous. Husqvarna models also incorporate a link between the top handle and the chain brake trigger. It will apply the chain brake if the chain bar is suddenly forced upwards. It’s known as an “inertia” chain brake, it will activate the chain brake even if the operator’s left hand is not forced from the handle. The chain brake is also useful when sharpening a chain on the bar, it allows robust filing without the chain slipping about. This safety feature is in addition to the normal chain brake. It’s activated by the front handlebar, and it acts when the bar is thrown back at the user even when a firm grip is maintained. It will stop the chain immediately even when the normal handguard is untouched. Tip protectors fit over the bar tip to minimize the risk of kickback. These metal or plastic devices prevent contact with the chain in the kickback zone. Tip protectors are usually fitted to domestic-class saws. These protectors are effective, but they also hamper the type of cuts that can be executed. Tip protectors are useful when used on pole pruners and domestic type chainsaws. Some tip protectors have a hook that can be used to “grab” branches for cutting, a useful feature. If fitted to a 120i or T435, it can be an advantage since these light chainsaws are often used by inexperienced and unskilled users. Correct chain sharpening is paramount to safety because a blunt chain cuts poorly, leads to increased operator fatigue and increased bar loading. Depth gauges filed too low make the chain grab at the wood and may negate the benefits offered by a safety chain. The size of wood chips from the cut is the first signs of a blunt chain. Small wood chips, together with lots of sawdust, are one of the signs that you need to sharpen the chain. Another sign is when you need to apply more pressure than normal to cut through the wood. One key sharpening parameter is the depth gauge setting. The depth gauge is the small steel protuberance in front of each cutting tooth. The height ratio between the leading cutting edge and the depth gauge determines the thickness of the wood chip that’s taken by the cutter. If the depth gauge is too low, the cutter takes too deep a bite from the wood. It increases the likelihood of kickback and the saw becomes difficult to control. The bar design can be altered to reduce the risk of kickback. The larger the radius of the bar tip, the greater the risk of kickback. The degree of engagement with the log (or another body) is greater for a larger tip. Domestic class bars, climbing saw bars, and entry-level professional bars usually have small tips. Professional bars, designed for logging and felling, may have much larger tips. They are often used for boring cuts to free trapped timber or fell difficult trees. A tapered, small-tipped bar will wedge easily when boring, stalling the chain. A large-tipped bar, with nearly parallel sides, bores easily and does not tend to jam. It’s a safety feature that protects you and the chainsaw should you have the misfortune of derailing a slack chain. It also catches a broken chain. A flying chain has an amazing amount of destructive force that can easily disfigure you. The chain catcher is easy to replace and usually made of aluminum. You will find it mounted underneath the saw right in front of the chain clutch. Its purpose is to catch and absorb the inertia of a broken or derailed chain. It’s not always effective and not something you want to test either. By keeping the chain tight but free, and lubricated, the possibility of needing one is greatly reduced. The chances of derailing a chain are greater when the chain is too loose, keep it trimmed. It’s also true when you put an undue side load on the chain in the cut. The engine is accelerated with the trigger under the rear handle of the saw. Unless the lock-out switch above the rear handle is also pressed, the throttle cannot move from the idle position. With the engine idling, the chain will also not be driven. The safety throttle ensures the throttle will only work if the lock is pressed. You have to hold the chainsaw’s rear handle with a firm grip to de-activate the lock. When starting the saw on the ground with your boot inside the rear handle, it will also prevent the throttle from moving. The centrifugal clutch disengages the chain from the engine when the engine is at idling speed. It engages the chain drive automatically when the engine picks up speed. Clutch drag, causing the chain to move slowly at idle, can be extremely dangerous for top-handled saws. You should ensure that the clutch and chain brake are functioning correctly at all times. To adjust it, you may need to consult your service dealer, but it’s always advisable to read the manual first. The rear hand guard protects the user’s right hand from being struck by a snapped or derailed chain. It also enables you to hold down the chainsaw with your boot while starting it. This is especially useful with bigger engines. To find a chain replacement, you’ll need to know the manufacturer, model and bar length or the chain’s length, chain pitch, and chain gauge. The number of lugs/links can also be substituted for the chain’s length. For most chainsaws, the information is available on the chainsaw bar. The owner’s manuals can also be consulted. Should you find nothing, the following information will be useful. To determine the pitch, you measure the distance between the centers of three rivet heads and divide the result by two. The rivets are the small, round pegs/studs that hold the chain segments together. Manufacturers describe chain length as the number of drive links/lugs plus the pitch calculation. The part of the chainsaw chains that fit into the saw’s guide bar is called the drive links or lugs. The drive link is the bottom part of the chainsaw chain. Chain gauge is the drive link’s thickness where it fits into the bar groove. The gauge of the chain and the bar must match to avoid a sloppy movement or binding when the chainsaw is running. A dial caliper will be useful to determine lug thickness.